Hotels near Parco Giochi "Don Luigi Verde"
The Parco dei Pricinpi Hotel was designed in 1960 by the famous Italian architect Gio Ponti. One approaches the hotel through 2 hectares of historical parkland only find it located on top a cliff sharing breathtaking views over the Bay of Naples. The interior of the Hotel has to be appreciated as one of the classic midcentury designs, all held in blue and white by Gio Ponti. The amenities offer a wide range of feel good factors, for the example the vast terrace for a magic sunset, a sea water pool surrounded by tropical tress and a wonderful restaurant sharing the same amazing sea view as the outside terrace. A lift within the building takes you down to the private beach where you can appreciate the black sand and clear water, the view across the bay and the steep cliffs towards Sorrento. The room's decor is held in the same shades of blue and white, Ponti envisaged for his entire hotel design, floor tiling and furniture alike. In the most comfortable bed we woke up to the infinite sea view. All the design appreciation and comfort wouldn't be without the very attentive, courteous and accommodating staff. Each one, with their friendly and highly efficient approach, made us feel very much at ease and welcomed and no favour was denied. The high quality standard of food and drink has to be mentioned here, too. All together an unforgettable and most pleasant...The Parco dei Pricinpi Hotel was designed in 1960 by the famous Italian architect Gio Ponti. One approaches the hotel through 2 hectares of historical parkland only find it located on top a cliff sharing breathtaking views over the Bay of Naples. 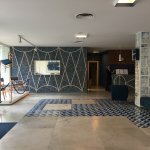 The interior of the Hotel has to be appreciated as one of the classic midcentury designs, all held in blue and white by Gio Ponti. The amenities offer a wide range of feel good factors, for the example the vast terrace for a magic sunset, a sea water pool surrounded by tropical tress and a wonderful restaurant sharing the same amazing sea view as the outside terrace. A lift within the building takes you down to the private beach where you can appreciate the black sand and clear water, the view across the bay and the steep cliffs towards Sorrento. The room's decor is held in the same shades of blue and white, Ponti envisaged for his entire hotel design, floor tiling and furniture alike. In the most comfortable bed we woke up to the infinite sea view. All the design appreciation and comfort wouldn't be without the very attentive, courteous and accommodating staff. Each one, with their friendly and highly efficient approach, made us feel very much at ease and welcomed and no favour was denied. The high quality standard of food and drink has to be mentioned here, too. Room tip: I believe each room has its own character and atmosphere whatever direction it is ponting. thank you for sharing your impressions on your stay at the Parco dei Principi. We are glad that you spent a memorable holiday here, and we hope to welcome you back in a near future! The price you found is 26% lower than this hotel's average rate of $652/night. The price you found is 12% lower than this hotel's average rate of $273/night. The price you found is 16% lower than this hotel's average rate of $327/night. The price you found is 31% lower than this hotel's average rate of $258/night. The price you found is 23% lower than this hotel's average rate of $1,170/night. The price you found is 30% lower than this hotel's average rate of $846/night. Stayed for a week in a Sea view room, well worth it, not sure rooms through the garden by the road would be quite as good. One of the best hotels we have stayed in over 40 years of travelling. Room was large, light, large balcony overhanging the ocean, well equipped, stunning views of Sorrento, Naples, Vesuvius etc, just beautiful. Garden equally beautiful, very pretty and well kept. Didn't try swimming pool but went down to beach level a few times which was nice, with options to lounge on the beach, or terraces. Breakfast excellent although buffet menu didn't change from day to day. Had dinner a couple of times, quite expensive and shame menu doesn't vary from day to day, however choice of restaurants within walking distance in Sorrento so not a big deal, restaurant and in fact all staff very good. Free shuttle to Sorrento very generous and frequent, worth using although only a twenty minute walk, but was pretty hot so shuttle welcome. Words cannot really describe how wonderful this hotel is, it is quite expensive but well worth the money and especially going for a sea view room. We are glad that you spent a memorable holiday here, and we hope to welcome you back in a near future. This hotel is absolutely beautiful. We booked a superior room with a sea view, and it was worth it! The view across the bay to Vesuvius is outstanding, and the cream was a firework display in the bay right in front of our veranda. The hotel is a twenty minute walk from sorrento( do not use a taxi 20 euros for a 1 mile journey). The breakfast was very nice and the staff were very helpful and friendly. Never used the pool but the platform by the sea was great. We are pleased that you enjoyed your stay with us and that you appreciated our hotel location, the food and service. Looking forward to welcoming you back soon to the Parco dei Principi. I'd rate the amenities at this hotel 5 stars -- the private beach and pool are spectacular, the grounds are amazing. All of these overlook the ocean and have a completely breathtaking view. Also, we used the hotel's shuttle to go to the port. A nice amenity but a little cheap of them to charge 5 Euro or something for each use, in my opinion. It's a bit of a walk from central Sorrento but we were fine with that. Just know cabs in the area are a total rip-off so try to avoid taking one! The rooms are decorated in a unique blue mid-century modern style. I get that and respect that it's unique (they say a lot of the current furniture is from when the hotel was originally built) but it's all done in a somewhat spare way, where the room and hallways feel a little basic for the amount of money that you're paying. (We had a "park view" in the main building...our guidebook told us the roadside building was even worse). Thank you for taking the time to write your review, your feedback is vitally important to us. I’m sorry you did not find the room to your liking, as the staff told you we are currently undergoing renovations throughout the hotel and look forward to providing updated rooms for our guests. We hope you will have an opportunity to return and enjoy the Parco dei Principi again in the future. My husband and I stayed here for two nights on our first trip to Italy in May 2017. The hotel is very mid-century modern with great decor. The staff was very helpful, especially the bartender. We had afternoon coffee both days on the veranda around sunset looking over the beautiful ocean and it was definitely a sight to see. The room was spacious, my only complaint is that the tub is very awkward, I almost fell getting in to it so be careful! The center is very narrow when trying to shower. If you're coming to Italy for the first time, be warned that they do not have irons/ironing boards in the hotel rooms, so pack a travel iron or plan to have wrinkle-free clothing. Otherwise, you have to send down for something to be pressed. Hotel has shuttle service that will take you close to the city center, or you can walk. We did both. Overall, this hotel was a great deal for the money. Room tip: If available, get an ocean view. The views are amazing. We are pleased that you enjoyed your stay with us and that you appreciated our hotel location and service. Kindly be informed that we will take for sure your useful comments into consideration. The views from the hotel on top of the cliff are amazing. There is a beautiful garden between the road and the hotel itself that cuts out all road noise. We stayed for 2 nights, and we had a fantastic time. There is private access to the sea from the hotel and the swimming area is protected so it's very calm and safe to swim. The rooms are clean and have everything you would need. All of the staff are friendly and helpful.